We want to celebrate the AP Maths 2016 class. We are so proud of them and all that they have achieved over the last three years. We had a total of 74 students who wrote their FINAL AP Maths exam in various venues across KZN & Gauteng in October. 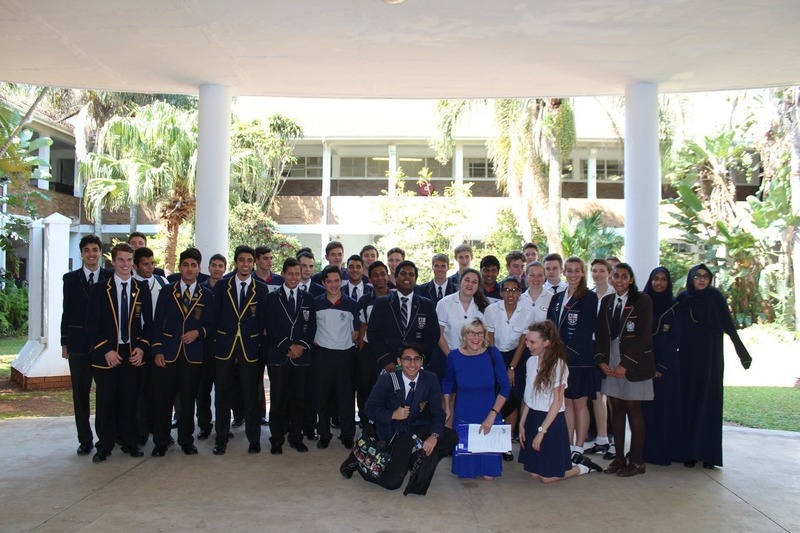 Well done to all our 2016 Grade 12 students! We couldn’t be more proud of you and all the effort you have put in. We wish you everything of the best for your future! There were a couple of special things about this group of learners. One of the most memorable being that, for the first time, we had a class from Greenside High School who wrote the exam after having completed three years of doing the course with us. This group of learners started AP Maths with Advantage Learn in Grade 10 in 2014. They are the first Advantage Learn Gauteng graduating class. Well done to this very special group of learners and our wonderful teacher, Roxy Lewis for your huge effort. We can’t wait to celebrate with you when your results come out. Our top learner overall was from Greenside High School. On that note, we need to mention that our top learner across all three centres, Mahir Ambelal was from Greenside High School. Mahir achieved a whopping 98% for his trials exam – a notoriously tough paper set by Trish Pike to ensure students will know what to expect when they get to their final exam. This is the highest mark any student has ever achieved in our AP Maths course for the trials exam. We chatted to Mahir briefly after the Greenside Speech night where Roxy Lewis was an invited guest. Mahir is planning on studying to be a Chartered Accountant or Actuarial Scientist. He really enjoyed AP Maths, particularly the Calculus and Algebra sections but commented that Stats was his least favourite section and the one he found the most difficult (you’re not alone there Mahir!) We intentionally do the Stats section of AP Maths instead of Finance as we find it is more beneficial for students in their tertiary studies. For Mahir, the most difficult part about AP Maths was the time pressure to complete the paper when writing exams. Something that really helped him prepare for exams was the extra sessions Roxy did with the class prior to their exams to help ensure they went in feeling prepared. Well done to you Mahir and all the best to you for your future! Our top learner from Westville Boys High School was Jono Major. He has plans to be an entrepreneur and will be doing a B.Com at either UCT or Stellenbosch. He knows that doing AP Maths was a good idea, not just for pushing himself during school but also in how it will help him during first-year varsity. Jono mentioned that he didn’t often get around to doing AP Maths homework, he only really crammed once a year prior to exams as he always had so much else on his plate. Despite this, he still managed to achieve an A in his trials exam and we’re sure he will do excellently in his finals. Jono mentioned that it wasn’t so much for him about doing well in AP Maths, rather just about exposing himself to the way maths is going to be at varsity. “I don’t put that much pressure on myself when it comes to AP Maths, it’s more about seeing what the maths is like and experiencing it in case I ever do need to come back to it. At least I will have an idea of what is going on and won’t be completely in the dark”. Our top student from Maris Stella was Sarah Herrington. We filmed our conversation with Sarah, and she had a lot of really helpful things to say, you can watch the full video by clicking on the image. Well done to our top three learners and the whole AP Maths 2016 class! Watch this space for some feedback on our final exam results which we will get in early January 2017. Managing Director of Advantage Learn from June 2016-December 2017. Caitlin is passionate about helping to build solutions that make the lives of South Africans better.